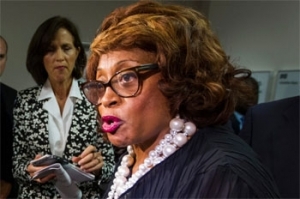 JACKSONVILLE, Fla. — US Rep. Corrine Brown of Florida and her chief of staff have been charged with multiple counts of fraud and other federal offenses in a grand jury indictment unsealed Friday after a federal investigation into a fraudulent charity with ties to the congresswoman. Brown, a 69-year-old Democrat, was to appear later Friday in Jacksonville federal court on charges of mail and wire fraud, conspiracy, obstruction and filing of false tax returns. She has represented a Jacksonville-based congressional district since 1993 — one of the first three African-Americans elected to Congress from Florida since Reconstruction — and is seeking re-election in a newly redrawn district. Also charged in the 24-count indictment was Elias “Ronnie” Simmons, 50, of Laurel, Maryland, who has served as Brown’s chief of staff since 1993. It wasn’t immediately clear from court records whether Brown and Simmons had attorneys to represent them. “Congresswoman Brown and her chief of staff are alleged to have used the congresswoman’s official position to solicit over $800,000 in donations to a supposed charitable organization, only to use that organization as a personal slush fund,” Assistant US Attorney General Leslie Caldwell, chief of the Justice Department’s criminal division, said in a statement. Documents previously obtained by the Associated Press from Orlando Mayor Buddy Dyer’s office show that he received an invitation bearing the seal of the House of Representatives to a July 13, 2013, golf tournament called the “Corrine Brown Invitational.” It was sponsored by the One Door organization and coincided with a freight and rail industry symposium in Jacksonville. The invitation said the donations would benefit a scholarship fund for the Jacksonville chapter of the Conference of Minority Transportation Officials and other charities. Authorities say none of the charities received any of the money raised.